When it comes to product value, it's difficult to beat Undercover brand canopies. 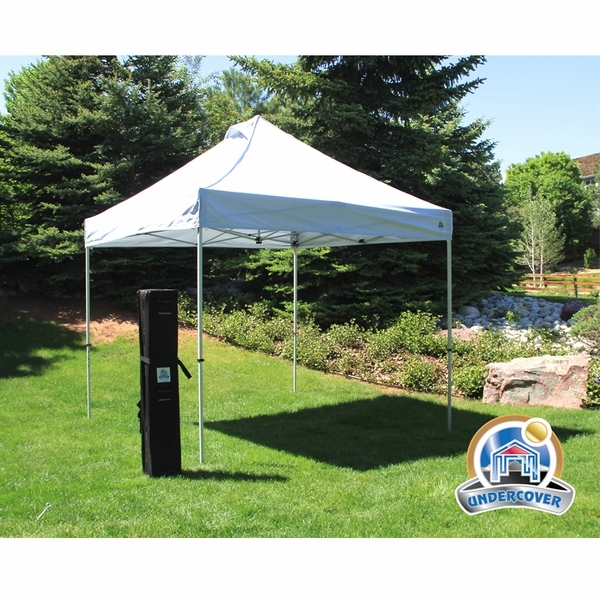 Undercover has developed their Super Lightweight Commercial Aluminum Popup-Shade Canopy Packages with White Top to make sure that you and all your guests have a space that is comfortably shielded from harmful UV rays. Everyone can sit back, relax, and discuss the events of the day without feeling the slightest bit of discomfort for any reason. The ventilated top allows pent up heat to escape, while the reinforced frame ensures durability despite its light weight. Need to be on the move? This lightweight canopy is easy to breakdown and transport to wherever life takes you. eCanopy.com - One Person Setup of Instant Canopy Instant canopies from Undercover Canopy setup quickly and easily, even with just one person! Is the flame certification sewn in the tent? This item meets both CPAI-84 and NFPA-701 Flame Certification. The top features only a CPAI-84 tag. Would this tent be safe to grill under? Per the manufacturer, you should keep all flame and heat sources well away from the fabric top. Undercover sates to never build fires within the shelter. The total package weight in the bag is roughly 48 pounds. Is the NFPA-701 certification sewn onto the canopy? The Undercover canopy is fire-rated, but it is not sewn onto the top. Please view our Caravan Traveler 10 x 10 Canopy Package Deal + 4 Sidewalls located here . This item is CPAI-84 Flame Certified, NFPA-701 Flame Certified, and the label is sewn onto the top. We experience very windy, especially spring and fall, seasons. How well will the frame and material hold up to strong wind gusts? We do plan to attach weights on the corners, since stakes are impossible at a farmer's market. This canopy does not have a wind rating. Most all pop-up canopies are recommended to take down in an event of strong winds. The canopy can be used for festivals and weight bags are highly recommended if you are in a windy area. If you need a stronger frame, please view our Caravan 10 x 10 Classic Commercial Grade Canopy Value Package located here. I have an "Undercover 10' x 10' Super Lightweight Canopy Package with White Top" Canopy; will the "Undercover 10 Foot Zippered Poly Sidewall - Set of Four" fit this canopy? Yes, those walls will work with the Undercover 10' x 10' Super Lightweight Canopy Package with White Top. Is frame a truss type (with bracing from the side same to the center)? Does this canopy have walls? This canopy does not have walls. Do you carry a similar item in a color other than white? I'm interested in 10' x 10' straight leg, vented roof. The white is too bright when sitting under it. You may find this model appropriate: Caravan Traveler 10 x 10 Canopy Package Deal + 4 Sidewalls. What is the weight of the canopy and four sides? The shipping weight of this item is 45 pounds. This will weigh 45 lbs. How much does this weight? What is the total weight in carry bag? Thank you. The total package weight is 48 pounds. 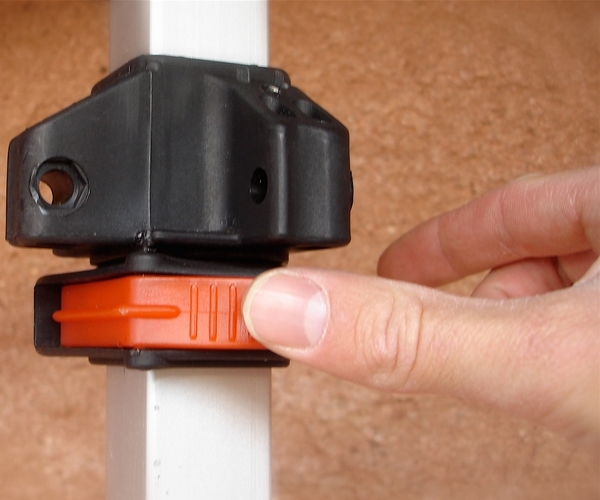 Can I get a replacement part for corner leg (the extension that slides down from the corner leg)? I'm sorry we do not sell replacement parts for Undercover canopies. Please, contact Undercover directly for availability. This models weighs in at only 48 pounds. Do you carry any 10 x 10 canopies that have a flame retardant certificate attached to the canopy? All of the Caravan canopies have the flame certification standards printed on a label that is sewn on to the top! Does this canopy come with the Velcro along the top to accommodate the side walls if purchased later? 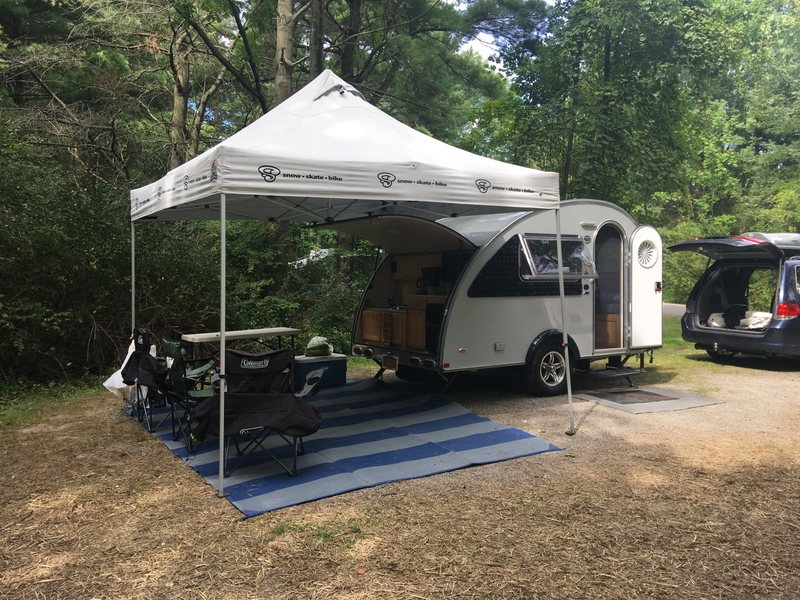 The sidewalls for this canopy (Undercover CRS Polyester Canopy Sidewall Enclosure Kit - Set of Four Sidewalls) have wire at the top to connect them to the frame and allow the sides to be drawn like curtains, as well as zippers on the sides. Does this canopy have the actual NFPA 701 tag hanging on the inside? This item meets CPAI-84 certifications, but will not include NFPA-701 ratings. Can you let me know the weight of this canopy please? Is this canopy completely water proof? This canopy is only water-resistant. 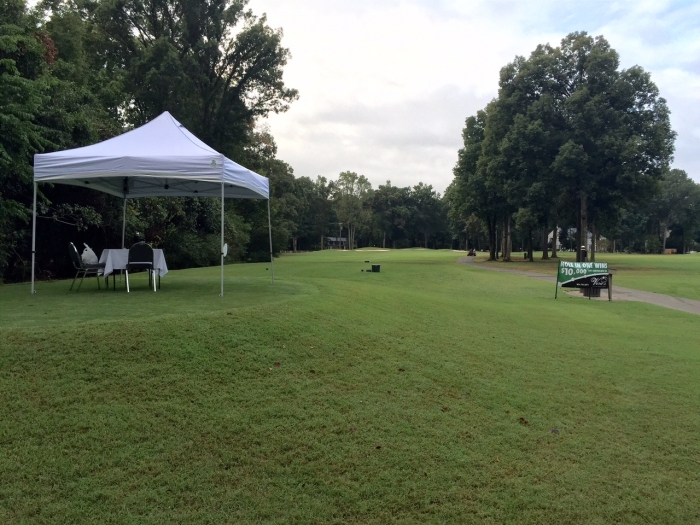 The only waterproof canopy in this size is the Vitabri V3 10 x 10 Aluminum Pop Up Waterproof Canopy . Can you adjust the height of the tent and can the canopy be replaced if damaged? This canopy has three height settings, to a maximum entry height of slightly more than 6 feet 8 inches, and a peak height of 11 feet. 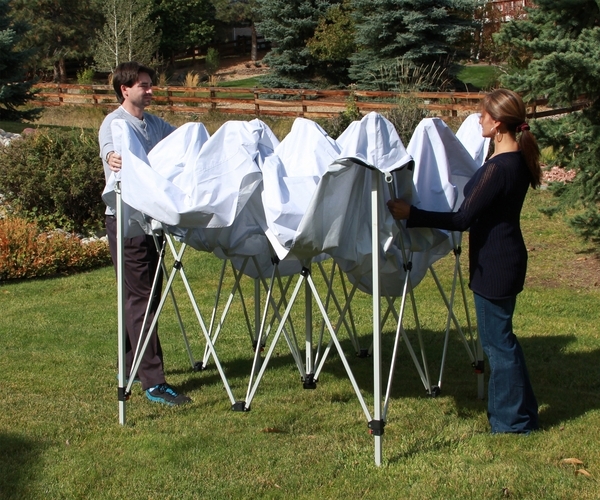 Are the legs square on the Undercover 10x10 super lightweight canopy? Would weight plates made for square legs hold it down adequately for camping or are weighted bags better? The legs are square. Plates or bags would work equally well. I use 10 penny nails as spikes. They are so much easier to carry around and they work even on a breezy day. Does this Undercover 10 x 10 Super lightweight canopy package with white top have straight legs and what size are the leg poles? 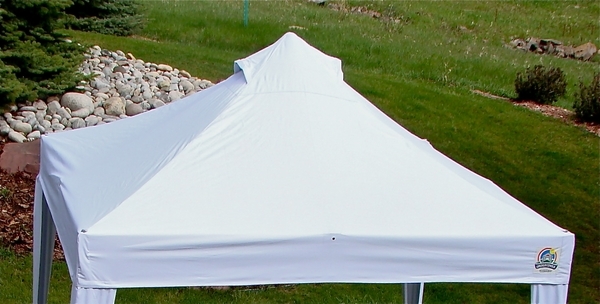 The Undercover 10' x 10' Super Lightweight Canopy Package with White Top does have straight legs and the diameter is 1". The legs are straight and square, but I don't know the size. Mary, It does have straight legs. And the leg poles are 1" square. I'm 6'4" and there is room for me to walk under the tent at the next to the highest leg extension. Does this Undercover 10 x 10 Super Lightweight canopy package with white top come with a bag to store it in on wheels? This item does come with a bag equipped with wheels. I can see that the frame of this Undercover 10 x 10 super lightweight commercial aluminum popup shade canopy package with white top weighs 24 pounds but how much does the canopy weigh with the top on? With the top and frame combined, the total weight would be 35 pounds. What is the total weight of this Undercover 10 x 10 Super lightweight commercial popup shade canopy package with the frame and cover in the carrying case? I see that the frame is 24 lbs. but I don't know what the weight of the entire setup is. I am going to some farmers' markets in northern California and the winter rains there are sometimes heavy. Will this Undercover 10 x 10 super lightweight commercial popup shade canopy keep me dry? We stood under our canopy during a 15 minute heavy downpour last week (Albuquerque, NM) and stayed dry. The manufacturer's information says the fabric is not waterproof, but it IS highly water resistant. If you were in a constant rain for a long time moisture would likely start to make its way through as the fabric got saturated. But roof slope means water runs off quickly. This is the second one of these canopies that I have had and I can tell you that when I was doing the Astoria, Oregon Farmers Market which was very windy and rainy much of the time, I was dry. It also held up through the rains in Illwaco, Washington. We did have to use weights to help hold the tent down in the winds though. This one I am just using in my back yard to keep the sun off me while grandkids are in the pool. I want to use this Undercover 10 x 10 Super Lightweight commercial aluminium pop up shade canopy package at the ocean in North Carolina. How well do the stakes do in the sand? Has there been any testing of these at the beach? Is there a wind rating for the canopy itself? This canopy's anchors are indeed effective in sand. There is no available wind rating for this canopy. For additional stability, we would suggest the Set of Four Undercover Gravity Tubes with Quick Straps. What is the total weight of this Undercover 10 x 10 Super Lightweight commercial canopy? Thank you for your inquiry. The total weight for the frame is 24lbs and the top will weight roughly 10lbs for the Undercover 10' x 10' Super Lightweight Commercial Aluminum Popup Shade Canopy Package with White Top. I would say 35 lbs. It is about half the weight of the canopy I was borrowing. I am 5'3 and found it very easy to load and manage on my own . I love this canopy and would recommend it over the heavier ones I have seen. The top cover is very good quality fabric and well made too. How much does this Undercover 10 x 10 Super Lightweight commercial canopy weigh? This canopy frame and top weighs approximately 35 lbs. Does this Undercover 10 x 10 super lightweight commercial canopy package have adjustable height? Adjustable, yes. The best canopy I have purchased so far. Yes, it has 3 options. Great canopy for a single person to use. Definitely need some type of leg weights for wind though. Yes, it is adjustable in height. Are there any sidewalls that fit this Undercover 10x10 Super Lightweight canopy other than the CRS System? I will be using this Undercover Super lightweight canopy package for an outdoor community event for my non-profit. They will not allow us to use stakes. Will this canopy blow away if it is not staked down? Yes, it needs to be either staked down or weighed down. It you cannot use stakes, we have Weight Bags and Gravity Tubes as an option. eCanopy sells a product that is a vinyl bag that you place sand in for weight. Each package contains 4 bags and straps to attach the bags to the canopy. Even a light breeze will require either stakes or the weight bags. All Of E-Canopy products are great, however, this unit seems a bit lite. In a normal breeze you should not have a problem but if the wind picks up, maybe 10 miles an hour or more, it could blow away. Otherwise it is a great product. I can't use stakes either. I use cement blocks to anchor each corner and that has worked. Good luck. Yes, you do not need stakes, but I highly recommend weights. Otherwise your tent might become unstable in windy conditions. You can buy weights especially made for canopies. Can you send me the flame retardant certificate or some sort of paperwork to go with this Undercover canopy package to show that it is fire retardant? The flame certificate can be found here. Does this tent come with proof of NFPA 701 certification? Can the certification document be found online? We can send you the certificate with the NFPA 701 certification but there is not a label sewn into the top showing that certification. I just purchased this tent. Do you have walls that I can purchase separately that are compatible with this model? Is it possible to get sidewalls with this canopy? Yes, I purchased sidewalls for mine. You can purchase the side walls separately or with a canopy package if you wish. They have a couple different types of sidewalls depending on what you want them to do for you and your friends. If it starts to rain you will have a lot more friends than you knew. I need a tarp canopy for an outside craft fair that will be very windy. I need it to be 10 feet x 10 feet and I would like it to be green, water proof, and wind proof. What would you suggest? The only actually water proof canopy we have is the Vitabri canopy. However, it is not wind proof. All pop-up style canopies must be staked or weighed down and must be taken down in stronger winds. What are the dimensions with the top peak included? The peak height is 10.5' and the head clearance is 84". Yes. This is a great canopy in our area we have to be ready for any type of weather year ruond, this canopy will fit the ticket! The customer service I received when ordering my canopy was exceptional, thank you! Does this come with the pole covers, too? No, they do not. The leg covers come with the Undercover Professional Grade Canopy only. Can I get another cover color besides white? No, this item comes in white only. You can choose different color tops for our Caravan brand canopies. Trying to decide between this canopy and the 10' x 10' undercover commercial grade. Obviously the commercial is heavier and I will be putting it up and taking it down constantly. Will be leaving the canopy at lake home and not moving it much. It's about $100 more. Want to use it for outdoor grilling and seating. Your thoughts please? The frame on the commercial grade is sturdier and will last much longer if you will be taking it up and down constantly. What is the total weight of the frame and canopy? The frame is 24 pounds and the top is approximately 7 pounds so the total weight for both would be 31 pounds. I live in a hot area of California. I want a one person set up (woman over 60 normal health) to be able to put up and take down on my own. I would be using this for dog trials. Is this the one you would recommend? The canopy is a very good choice for setting up by yourself. However, while it will allow some of the sun to come through the fabric, it will block much of it. 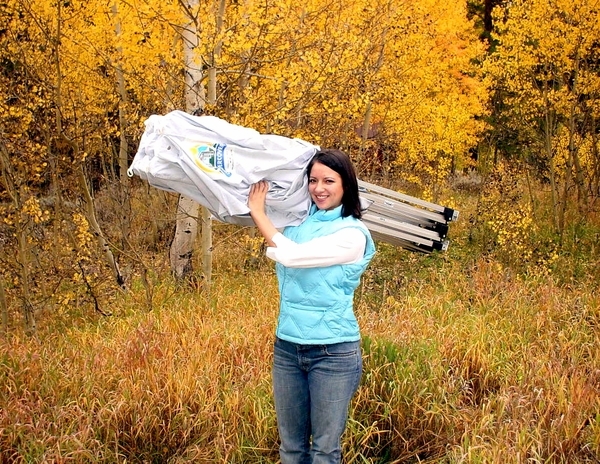 When folded, what is the height of the tent bag--is it 63"? I have a Honda Fit and need a tent that fits in my Fit! Ha! Also, I'm a one-woman operation, can I really put this one up by myself? My old Quick Shade was a two person operation - I'm looking for easier pop up! This unit is 63" when folded up. You would have to use a measuring tape and measure the cargo area in your car to be sure about the fit in your Fit. The total weight is 24 lbs for the frame and the top is probably less than 10 lbs. You would really have to use good judgment on how much you can personally carry, lift and manipulate. We have a video that shows one person setting the unit up and taking it down. Are there screen sides for this awning? Will the item QUK-132174 walls fit the 10 x 10 Undercover super lightweight commercial aluminum popup shade canopy? I would recommend using the QuikShade walls on the UnderCover frame. Slight size variations may cause the QuikShade walls to not fit properly. Is the CPA-84 Fire Retardant code sewn on the canopy anywhere? Yes. The CPAI-84 fire rating label is sewn to our UnderCover brand canopies. Does this come in any other colors besides white? What are dimensions of this canopy when it's in the carry bag? It is 63" x 12" x 12" when in the carry bag. Is this canopy NFPA-701 rated? It is indeed NFPA-701 rated. Smooth, easy and handy. Very easy to operate. I would recommend to anybody for outdoor events. I just replaced the 3-year-old undercover canopy that I purchased from you 3 years ago and bought a new one for my farmers market set up. I set up for 3 markets a week and the undercover canopy worked great. ProsFrame and cover held up well for 3 years of abuse. Consnone. some would say the price, but i've seen several 75-80 dollar tent break after just a few uses. Great, Reliable Shelter for All conditions. Best bang for the buck. I got 15 years out of my first shelter. It was used for everything from commercial events, camping, bike races and more. It was subjected to wind, snow, smoke rain and hail. It was finally done it by a 50 MPH wind storm. Completely my fault for not taking it down before we left camp for an adventure. Santa Claus brought me a new one this year. I can't wait to use it. Exactly what l need for Farmers Markets. The carrying bag is convenient and makes it way easier to move considering it is pretty heavy. This canopy is very well made and for sure the lighter one out there. I am a 42 old woman and sell my homemade pastries at farmers markets. My back was in pain every week from dealing with heavy canopies. The pain is over with this canopy and the embarrassment too, because I don't have to ask for help to other vendors to set it up anymore, now I am able to do it myself in 30 seconds! ConsThe sun protection is not the best. I am planning to buy a thicker top to protect my skin. First year with farm, we bought this canopy for the Farmers markets and to sit infront of our fruit stand on occasion. It will not withstand a windy day near lake Ontario, even lashed to supports of fruit stand, frame is not strong enough. Otherwise, nice days worked just fine and it offered adequate protection in rain, even without waterproofing. Had hoped the "feet" would not be plastic, hopefully they will hold up. For now, it is very easy to deploy and simple for one person to carry. Great product. Love the top vents. Carry bag is sturdy and functional. This thing set up so easily and was sturdy once the weights were applied. I loved the protection from the sun! Easy setup. seems very well made. I have used it on the beach for two weeks now with no problems. ..Will be taking it home to continue using it around our pool. Everyone has agreed it has been a great purchase for those of us who would like to be at the beach but not in the sun. ...White color seems to keep it cooler underneath as well. I use it at farmer's markets to shield my crafts and merchandise from to much sun and rain. 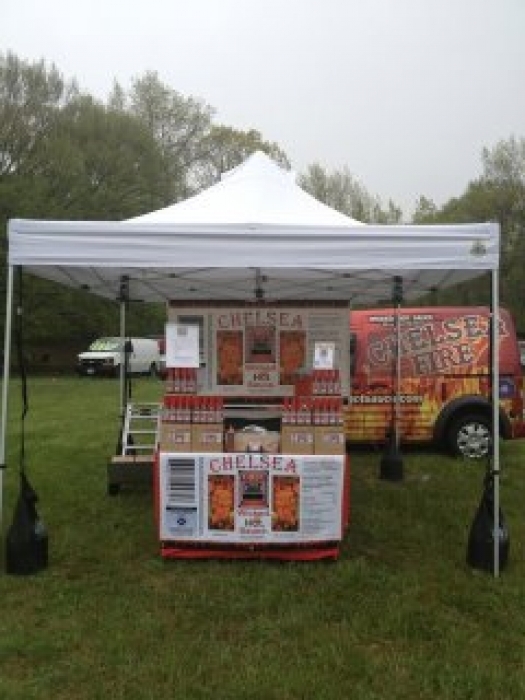 Almost every vendor, including my 4 piece band, Isles Vibe, at the White Barn Farm Plant Sale in Wrentham, MA. used the eCanopy. It provided excellent protection from the sun and was very easy to put up and take down. I highly recommend this outstanding product! I am 71 and doing outdoor shows is such a chore. I was ready to quit. Since I go it alone, I always had to ask for help getting my tent up. I could never get the top latches. Last year, I lost my heavy duty tent to the wind. I decided I would give it one more year and bought this super light weight tent hoping for the best. It arrived in a box in good shape. Not only was the top easy to get on, I could put it up by myself just as advertised! The corner posts were a breeze to push up and get to latch. I am so glad I decided to invest in this tent. Thank you for offering it. Purchased 10' x 10' light weight canopy in white to use in our clubhouse pool area. Worked great, giving the older folks a shady spot out of the sun. Best Tent in 10 years! After 10 years in business and multiple tent purchases, I have finally found a tent that is not only lightweight, but I can set it up on my own! After 10 years of trying out tents, this is the easiest to put up on my own and lightest. I'm 67 years old and those are important facts so that I can keep on attending the farmer's market. Undercover 10 foot aluminum tent delivered on time and with good directions. Well designed and very easy one person setup. eCanopy good place to shop. We love this Tent. It's sturdy, easy to open and close, and serves our purposes perfectly! Perfect in all ways described, even the instructions! Love the lightweight tent. The boys will benefit from the shade and my husband wont complain about carting it around! This Makes Our Fourth Canopy!! 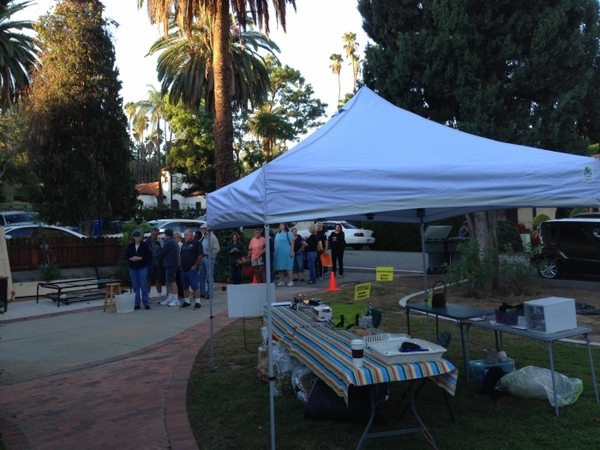 We are a community organization and we set up booths at events such as our weekly Farmers Market. We got one a few months ago when an older canopy broke , and these new ones are so much lighter and so easy to put up! One person can actually put them up by themselves!! Great quality and easy to work with. When I ordered this last one, (which was the fourth one for our organization) it shipped the next day and was here in 3 days. The canopy came quickly in time for my art fair. I was surprised how compact this package was, and that I could leave the canopy on the folding structure for storage. It went up easily in the field, with the help of neighboring artists who were familiar with the style. This is the first canopy I purchased, have had it for a little over a year and a half now, and feel that I can give an informed review! This canopy is easy to put up and take down alone, at times my 11 yr old daughter has done most of the down part herself while I was packing my van (shes 5' so the size of a small adult!) I ordered the sidewalls separately, wish I had gotten them all at once, lesson learned... I ordered the CRS sidewalls that open and close like a shower curtain, and am always being complimented on the professional look of my booth! We are located in NC, and have all sorts of weather, that being said the fabric is not waterproof or resistant, so we have sprayed about 3 cans of Kiwi Camp dry on the entire thing, then we used tent seal for the seams. This has worked great, however it does need to be reapplied now, its been since last spring when it was done last, so maybe yearly. The only problem I've had is in a downpour we couldn't keep the rain from pooling in the corners, and that stretched the fabric in one corner, so now when it rains it pools in that corner mostly. We just keep a telescopic camera pole handy to let the water off in that situation. I have had one situation where the wind took my canopy and used it as a kite before I could get it secured!! It was tossed around the yard a few times and bent two bars, this was easily fixed with screws and PVC pipe (I had a show the next day and no time to get the correct replacement parts, but it works so well that we are just going to keep using it as it is.) Its not noticable unless pointed out, so this is also a very sturdy made canopy, especially to be so lightweight. We are looking to expand and am now looking to buy our 2nd Undercover Canopy, this time we are going with the combo package! ProsLightweight, easy to put up and take down, professional looking, very sturdy Case has shoulder straps, wheels and multiple handles, so very easy tand versitle o carry. The undercover 10X10 super lightweight canopy package with white top is more than I expected. It withstood wind gusts up to 35 mph the first day I set it up which blew me away. Very easy to set up, no problem for one person. I highly recommend this canopy. This was my second canopy and by far easier to put up. It is lightweight and served its purpose well. I was able to put up this canopy with ease and taking it down was a breeze. The rolling bag is large enough for the canopy and not too tight. It was important to find a canopy that met my needs, but most importantly, it was the customer service that I received. 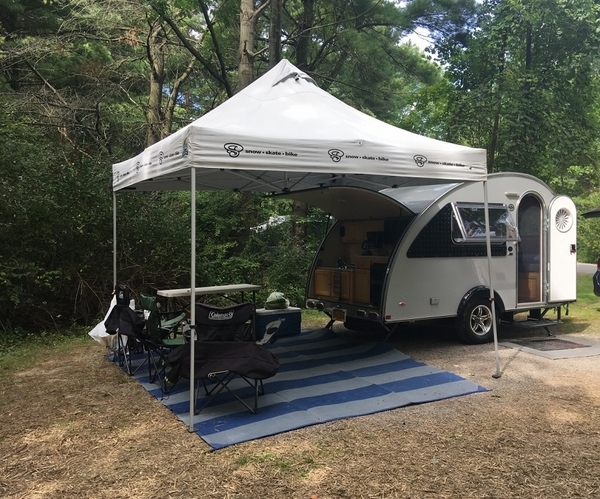 I had a limited amount of time to find a white canopy and the folks at eCanopy couldn't have been more helpful to me. They found a perfect product, addressed my multiple questions, and had it shipped to my door before I even expected it. Many thanks to Kelsey for her wonderful assistance!! Because of her, my outdoor show was a huge success! Outstanding customer service!! I would highly recommend this company to anyone! ProsLightweight and easy to assemble. Quality product! Best prices I found online. The tent we ordered was very easy to put together. We were initially worried about getting the tent in time for our event but it arrived just 2 days after we ordered! Seems like a quality product! This is my fourth canopy and it is by far the easiest to set up. I can do it by myself in a few minutes It seems to be well made and I like the lighter weight too. Undercover makes a commercial model which I also have, but it is much heavier. The commercial model does seem more sturdy so if weight isn't an issue, I would go with it. I prefer hauling around the lighter version because i am traveling to many different shows, and it seems to do just fine. LOVE LOVE LOVE. I HAD A SMALLER 8x8 AND IT WAS SO HEAVY. LEG BENT AFTER 3RD USE. BUT THIS POP UP IS SO EASY TO SET UP BY YOURSELF. LIGHTWEIGHT YET STURDY. NO METAL BUTTONS TO TRY TO PUSH IN. EASY TO TAKE IT AND OUT OF BAG. HIGHLY RECOMMEND!!! As described the product is light, easy to set up & take down. We are very pleased. This is a Very Nice Canopy tent, Easy to use and great value. I have had others and this is much nicer and easier to use. I highly recommend it. ConsReally None, it would have been nice if the Canopy itself was on the frame when it came in, but it is no big deal to put on. The tent was made of very high fabric, and I was overall happy with my purchase. It was a big investment for me, but I wanted a sturdy product to use multiple times. ProsBag, weight and ease of use! This canopy was a dream out of the box. Initial setup took perhaps 20 minutes, one-person operation. Subsequent setups were easily 10 minutes by myself. My brother-in-law had one, we were very impressed with his. ConsThe directions for adjusting the tension for the top was a bit to vague for my taste. At the last show I used it at it was one of two that didn't leak in the rain, it turned out the other was also canopy. It's light and easy to assemble, I am very happy. Very easy to handle and put up. We love our canopy!!!! We have 2 sets of friends that have them and we decided we needed one this year! We have already used it for a week long vacation at the beach and plan on using it on our next beach vacation in a few months!!! Very sturdy, quick to put up and take down, and we think it's cooler thanks to the 99 spf!!!! It is lighter weight, well-made, and easy to put up, though it would still be a pain to do alone. Two people make the job much easier. This is my second Undercover canopy and they are very good products. I was hoping the aluminum frame would be better for beach use, but because it is lighter, I'm now using the corner ropes and two sets of stakes. So far so good! This item is just as described. Lightweight, easy to put up with just one person as demonstrated. Would definitely purchase from this company again. It took me a couple of times to get the hang of it and now I move it and set it up two or three times a week by myself. I do farmers market and keep on looking at my neighbors other models without any regret. ProsRelatively light and very well packaged in its bag that comes with handles, pockets and wheels. I bought this canopy to use when I sell my handmade soaps at the Farmers Market. I have not used it yet, but I did however, set it up in my back yard to see how difficult it would be to set up. Once I figured it out, it will be very easy to set up - taking down was easy as well. Folded up nicely and fit right back into the carry case with the top one with no problems. The canopy is really nice and will certainly serve my purpose. The price was reasonable, free shipping was great. I would recommend this canopy for sure. ProsEase of setting up and taking down. ConsNot really a con - a suggestion. A plastic piece on the outside of the case that touches the ground when you pull the case so that it protect the case from wearing out or tearing when you pull it on asphalt. We have used this canopy for years for daily use at the coast as well as for events inland. Just this weekend it was used as cover for a fund raising event, which endured a dramatic hot afternoon thunderstorm. It stood firm and protected all of us beneath. Several commercial canopy rental businesses along the North Carolina coast use this same canopy. It has proven to be a workhorse for us. It stands up to coastal wind, salty air, and sand. When we set up the canopy in locations of potential bursts of strong winds, we use additional more substantial tent stakes alongside the simple metal stakes that come with the canopy. The canopy holds extremely well with the additional more substantial tent stakes. We keep a rubber head hammer and the additional tent stakes in the bag with the canopy making it ever ready for set up. Many of the components are replaceable making this canopy a "keeper". We love the tent. We had two shows and it held up through some strong winds. We bought the bags and filled it with rocks, it looked great. Other vendors had water jugs hanging from theirs. I would recommend people purchasing the bags. Easy set-up and take down. Fits great in the sturdy bag it comes with. Looks great. Much better than what other stores offered. It is well made and lightweight so I can put it up by myself and not strain my back carrying it in the case. Speaking of the case, it is well designed and well made for easy storage and access. The snap locks on the legs are easy to use, and I like the open/closed vent at the peak. My previous canopy was an EZ Up which was more expensive and much heavier and difficult to put up. I would recommend the Undercover Canopy in a heartbeat. Used my new tent at my first outdoor art show. It's the perfect size. Tall and lots of room. Easy to set up. I love it! 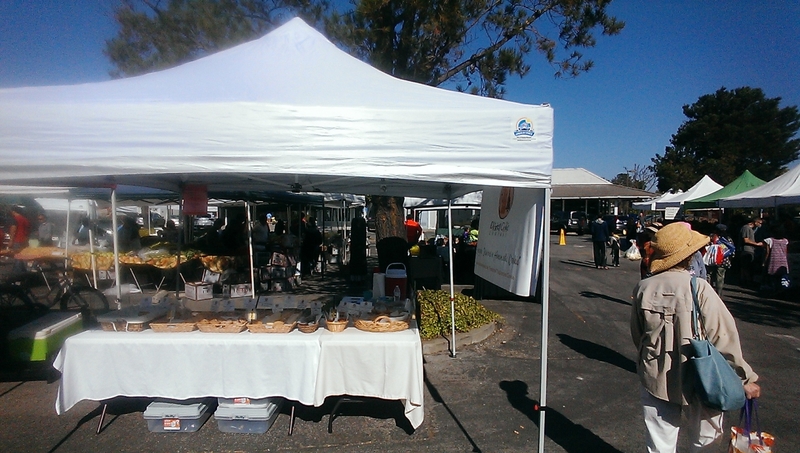 I am using this tent at a farmers market and am very pleased with how easy it is to operate, transport, and use. We are thrilled with our new canopy. It is straight forward to set up and really sturdy. We used it for the first time at an Earth Day Fair where there was no grass to stake it down with. We were able to easily attach buckets to each leg so that we could secure it and the canopy itself secures to the frame really nicely. We are very happy. 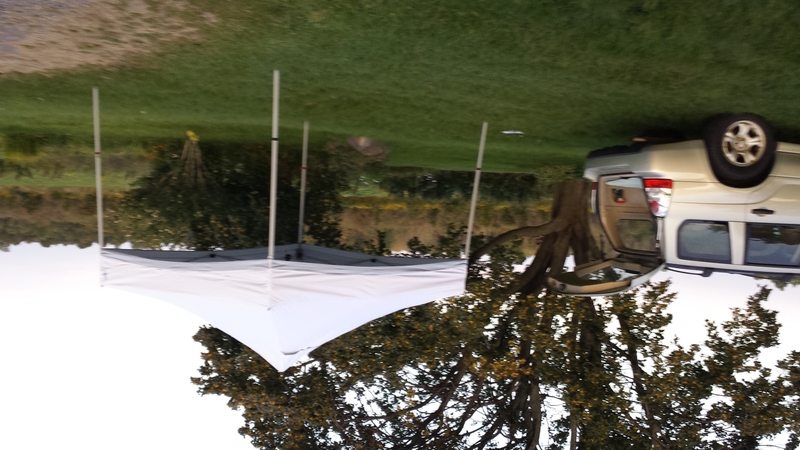 I have set up canopy tents every weekend for 11 years and this is the lightest, easiest tent to put up and take down. It has the best roller bag out of any tent I have ever owned. It even can be worn like a back pack because it is so light and it has comfortable strap to do just that. I'm so glad that this is the tent I'll be using for years to come. I have been using a friend's tent for the farmers market and I figured I'd get my own. Hers is a 10 x 10 pop up Undercover commercial and that's exactly what I wanted. It's easy to put up and take down, very sturdy, attractive, and the wheels on the carrying case make it easy to transport, even over grass. I've used a few other brands of tents over the years, but this one by far is a winner. ProsEase of putting up and taking down. ConsDoes need to be well-secured if it's windy. I was in the market to buy a pop up tent for the farmers market (never owned one before). When I came across this one, I noticed it had a five star rating, read all the reviews, watched the video and I was sold. I'm happy to say I used my canopy for the first time yesterday on Valentines Day! It truly is an Amazing Canopy ~ super easy for one person to set up, light weight and it comes with a convenient strapped wheel bag. LOVE IT! I needed a canopy that one person could set up in case I have no help with my Dj gigs. I found this one, I was a little skeptical at first but, just as advertised, it is So easy to set up! It's Great! Biggest plus is ease of set-up/take down for one person. It is also very light which makes it easy to carry but more vulnerable to wind. I plan to anchor it better than my old steel one that it replaced. 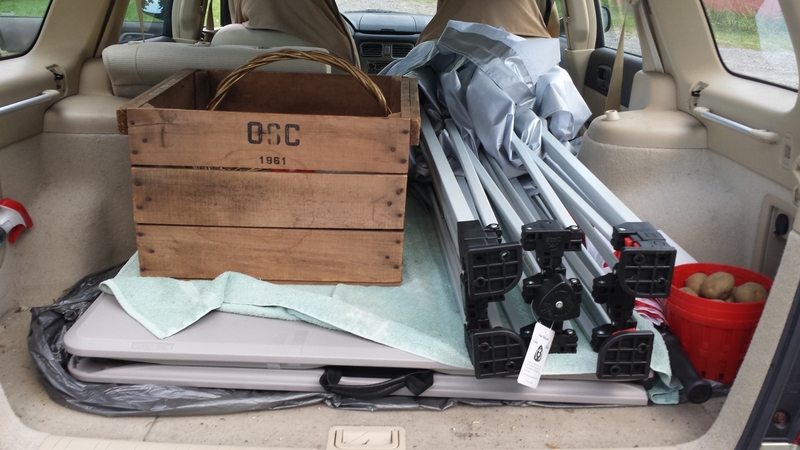 We had purchased another canopy from another place first, which we could not open and which weighed a lot. This one is beautiful and just the opposite. Light, sturdy and really easy to set up and take down. The packing bag is very well made with wheels making it very easy to move. We love this canopy! ProsLight, packs away easily, very nice looking. ProsLooks great. Easy to assemble. Holds up to moderate wind. Setup was easy and it seems to be a good product. I'm very satisfied with the canopy. ProsEasy setup and it comes with a storage/carry bag. It also came with a few replacement parts in case of breakage or loss. ConsNone yet; only time will tell. We did a dry run yesterday before my craft show and were delighted in how well it was made and how just common sense all the parts and directions were. We are very happy with our buy and really loved the Velcro usage on the canopy so it was put one once and done! We highly recommend this sturdy Canopy. We used our new canopy for the first time this Labor Day weekend to celebrate our grandson's 2nd birthday. It worked beautifully. My husband and son-in-law were able to get it assembled in about 15 minutes. We had a 10 foot table under it and it was a perfect fit. Going to be using it again this coming weekend for a baby shower I am hosting. Would highly recommend it. ProsVery easy to assemble, nice looking, easy to take with you. Even as an older senior it was easy to set up and easy to take down and put back in its traveling bag. The canopy was everything it claimed to be - totally satisfied!!! I am a disc jockey and purchased this canopy for shade at my various outdoor parties when I need shade. The first party went extremely well. The weather was hot and sticky so I decided this was the time to activate my new purchase. Lightweight to carry and extremely easy to put up I was very satisfied with this purchase. All the people I dealt with from this company were pleasant while they gave the best service I have experienced in a long time, therefore, I highly recommend this purchase and eCanopy.com. To anyone reading this - I am a female - if I can do this canopy alone so can you. Best one I've had so far! I use a canopy 4 days a week (up and down daily) this one is by far the best one I have ever used. Consbecause of the aluminum frame used to make it light weight, it bows very easy and needs weights to hold it down if not staked in. This is my second tent purchase from Undercover. I use mine for farmer's markets every week and I love it. I'm a woman and I can put this tent up and down easily by myself and carry it also. I've tried about 3 other tent brands and this is by far the best one. It's lightweight but also very strong. Ours has been through winds, rain and snow at markets and has held up through all of it. One of the best features about this tent is the ability to tighten the top so the canopy stays tight- this is key when it rains so this tent doesn't collect water like Easy-up tents do. We used to go through about one tent a year with the other brands but have had the Undercover one for over 4 years. Would highly recommend this product! ProsVery easy to use. Durable- have used ours for over 4 years and it still works like it did the first time we put it up. The ability to tighten the canopy. ConsHaven't found anything that I don't like about it. Previously I had a "cheaper" type canopy that lasted 2 yrs. I primarily use it for shade while surf fishing the beaches of Delaware. The wind made short work of the "cheap" canopy. I was reluctant to purchase a new canopy, fearing that it would be made of the same lightweight material for framing. The frame on this 10x10 is awesome! I used it last week in 15 MPH winds and NO PROBLEMO!!!! I am very happy. The shipment was track-able and fast. I highly recommend!!! ProsStrong and durable! Well manufactured. ConsOverall size in case. (strength over rides)! Love it. Great value. Came in a really nice case that will roll but also has shoulder straps. Super fast shipping from this store! Light weight and sets up easily and quickly. It is not designed to be left up and I don't think the frame can withstand anything but a moderate wind. ConsNot much... do not believe it can withstand much wind. Easy to set up. 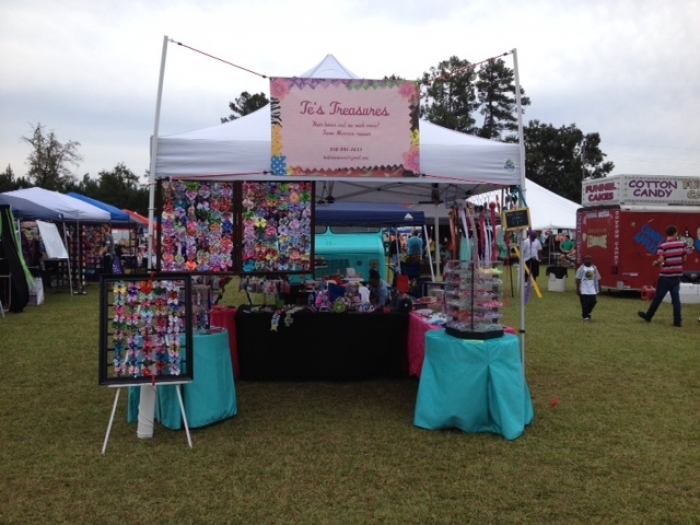 The first canopy I brought and returned from another vendor required a minimum of 4 people to set up. I'm 70 years old and I set this up myself in minutes. For the extra money, this canopy blows away the cheap steel ones. The frame is impressive and I can easily deploy it myself in 60 seconds. To have a solid 10x10 shelter for my family in 60 seconds or less is what made this an attractive deal. The frame lockouts seem durable and self lock during setup. The top seems durable and is vented. They also offer replacement tops for $100 and frame replacement parts. Now that I've used it a few time I would purchase another without hesitation. I do suggest the undercover brand weight kit for beach use. ConsRequires weight kit for anything but calm winds. I bought this as a Father's Day present for myself so that the kids would kick in for something I really wanted. Works great and is ideal! No assembly required, it set up in 5 minutes with my son helping me, and looks great! I will be taking it down and moving it to a different site in the next couple of months. I am in Los Angeles area so I plan to leave it up year-round as an extension to an outdoor patio. It's great for my purposes and at the sale price especially, it's the right price! ConsNot a thing! It exceeds my expectations! This tent is half the weight of most that are as sturdy...I see people struggle with an Easy-Up...I laugh. This canopy is a breeze to deal with. All my festivals I do alone with no help and I'm 5 feet tall...If I can, anyone can !!! I've only put up my tent twice. So, I can't speak for the longevity of it. But, it was quick and easy. I could do it by myself, with ease. The quality seems really good and I like the way it looks. As a solo Farmers Market Vender, this is THE BEST tent around!! I can EASILY carry and set up this tent alone. It is great in wind and rain. Service is also excellent. I highly recommend this store! I have had this product now for over two years, use it for shade at kart races all over Arizona. Have seen wide that has folded up other pop ups and this one still stands firm. Make sure you weight it down properly. Easy set up with one person, great storage bag. Can't say enough good about this one. WOW. 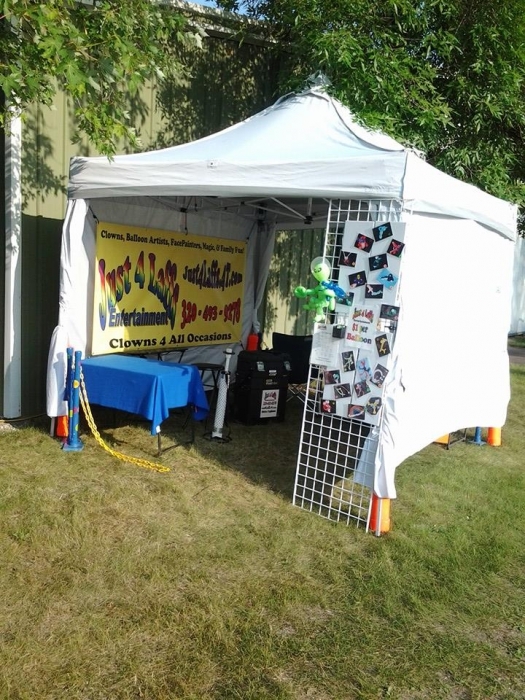 This is a great pop-up (UC-3 10x10 popup), and with a great value and awesome customer service, I cannot say enough about this company. We initially purchased 5 for our public Kite Festival held each year at our campus. After our first year of use, we purchased 5 more. This year, we purchased 4 more! They offer the best value in the industry. Their customer service is exceptional. We have gotten support for parts and been able to easily contact the company and ALWAYS received great service and support. If you choose UnderCover, you will be working with a professional, results driven, and customer-service oriented company. We are glad we chose them!"